Building MEMS; hybrid quantum logic gates; teaching cars to see. The microelectromechanical systems (MEMS) market was $12 billion business in 2014, dominated by a handful of devices, such as accelerometers that reorient the screens of most smartphones. 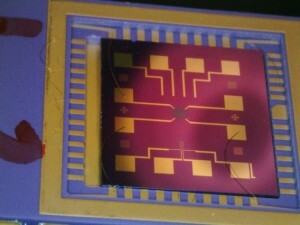 However, researchers at MIT pointed out that potentially useful MEMS have languished in development because they don’t have markets large enough to justify the initial capital investment in production given that manufacturing MEMS has traditionally required sophisticated semiconductor fabrication facilities that cost tens of millions of dollars to build. Now, two recent papers from MIT’s Microsystems Technologies Laboratories offer hope that that might change. In one, researchers show that a MEMS-based gas sensor manufactured with a desktop device performs at least as well as commercial sensors built at conventional production facilities. In the other paper, they show the central component of the desktop fabrication device can itself be built with a 3D printer. Together, the papers suggest that a widely used type of MEMS gas sensor could be produced at one-hundredth the cost with no loss of quality. He said the techniques developed could lead to novel biological sensors as it allows the depositing of materials that would not be compatible with high-temperature semiconductor manufacturing, like biological molecules. In addition, the papers open new technical paths to making gas microsensors, which, from a technical point of view, may be easily adapted to mass fabrication. As part of a plan to help get quantum technology out of laboratories and into the marketplace, a University of Oxford-led EPSRC-funded ‘hub’ has been looking at different aspects of quantum technology in order to shape the future of quantum networking and computing, towards the ultimate goal of developing a functioning quantum computer. The so-called Networked Quantum Information Technologies (NQIT – pronounced ‘N-kit’) Hub, based at Oxford that involves nearly 30 academic and industrial partners, has been focusing on developing quantum technologies that they say could dwarf the processing power of today’s supercomputers. The Oxford researchers pointed out that developing a quantum computer is not merely a different technology for computing in the same way everyday computers work; it is at a very fundamental level a different way of processing information. And it turns out that this quantum-mechanical way of manipulating information gives quantum computers the ability to solve certain problems far more efficiently than any conceivable conventional computer. such as breaking secure codes, or searching large data sets. Here, quantum computers are naturally well-suited to simulating other quantum systems, which may help, for example, the understanding of complex molecules relevant to chemistry and biology. They said one of the leading technologies for building a quantum computer is trapped atomic ions, and a principal goal of the NQIT project is to develop the constituent elements of a quantum computer based on these ions. Each trapped ion (a single atom, with one electron removed) is used to represent one quantum bit of information. The quantum states of the ions are controlled with laser pulses of precise frequency and duration. Two different species of ion are needed in the computer: one to store information (a memory qubit) and one to link different parts of the computer together via photons (an interface qubit). The researchers have demonstrated the all-important quantum ‘logic gate’ between two different species of ion – in this case two isotopes of calcium, the abundant isotope calcium-40 and the rare isotope calcium-43. The Oxford team has previously shown that calcium-43 makes the best single-qubit memory ever demonstrated, across all physical systems, while the calcium-40 ion has a simpler structure which is well-suited for use as an interface qubit. The logic gate, which was first demonstrated for same-species ions at NIST Boulder (USA) in 2003, allows quantum information to be transferred from one qubit to another; in the present work, the qubits reside in the two different isotopes, stored in the same ion trap. The Oxford work was the first to demonstrate that this type of logic gate is possible with the demanding precision necessary to build a quantum computer. As such, they were able to perform a ‘Bell test,’ by first using the high-precision logic gate to generate an entangled state of the two different-species ions, then manipulating and measuring them independently. This is a test which probes the non-local nature of quantum mechanics; that is, the fact that an entangled state of two separated particles has properties that cannot be mimicked by a classical system. This was the first time such a test had been performed on two different species of atom separated by many times the atomic size. There is still work to be done but the significance of the work for trapped-ion quantum computing is that they’ve shown that quantum logic gates between different isotopic species are possible, can be driven by a relatively simple laser system, and can work with precision beyond the so-called “fault-tolerant threshold” precision of approximately 99% – the precision necessary to implement the techniques of quantum error correction, without which a quantum computer of useful size cannot be built. University of Cambridge researchers have developed two technologies which use deep learning techniques to help machines to see and recognize their location and surroundings could be used for the development of driverless cars and autonomous robotics – and can be used on a regular camera or smartphone. Of course, vision is our most powerful sense and driverless cars will also need to see, but teaching a machine to see is far more difficult than it sounds, the researchers pointed out. The two systems for driverless cars can identify a user’s location and orientation in places where GPS does not function, and identify the various components of a road scene in real time on a regular camera or smartphone, performing the same job as sensors costing tens of thousands of dollars. Although the systems cannot currently control a driverless car, the ability to make a machine ‘see’ and accurately identify where it is and what it’s looking at is a vital part of developing autonomous vehicles and robotics, the researchers said. The first system, called SegNet, can take an image of a street scene it hasn’t seen before and classify it, sorting objects into 12 different categories – such as roads, street signs, pedestrians, buildings and cyclists – in real time. It can deal with light, shadow and night-time environments, and currently labels more than 90% of pixels correctly. Previous systems using expensive laser or radar based sensors have not been able to reach this level of accuracy while operating in real time. The localization system runs on a similar architecture to SegNet, and is able to localize a user and determine their orientation from a single color image in a busy urban scene. They say the system is far more accurate than GPS and works in places where GPS does not, such as indoors, in tunnels, or in cities where a reliable GPS signal is not available.